On August 6, 2011, Chuck MacDonald passed away peacefully at the age of 88 years. Tipping a dram in his memory are his children, Rob, Marg, Sheila, Shelly, and Grant. He will be forever remembered by his children, their spouses, his grandchildren, and his great-grandchildren. He was predeceased by his wife, Louise; son, Hugh; and daughter-in-law, Vivian. 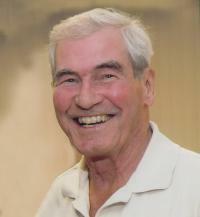 Chuck had a long career with the Bank of Montreal, was an active member of many community groups and charitable organizations and an avid supporter of Edmonton’s sports teams, as well as a long time member of the Robbie Burns Club. A Memorial Service will be held at 2:30 pm on Friday, August 12, 2011, at Foster and McGarvey Funeral Home, 10011 - 114 Street, Edmonton. Donations in Chuck’s memory are gratefully accepted to the United Way, 15132 Stony Plain Road Edmonton, T5P 3Y3.